Undoubtedly there will be tons of photographers and screaming fans outside as Ben Stiller, Jessica Chastain, Chris Rock, Martin Short, Jada Pinkett-Smith and David Schwimmer ascend the steps at the Palais des Festivals for the world premiere of their latest film. And it will be the best look at them that the crowd will have all night, particularly since they won't be onscreen — the movie is Madagascar 3: Europe's Most Wanted. The latest DreamWorks Animation effort may seem like a surprising fit for Cannes, usually perceived as the stomping grounds of the world's great auteurs, but the festival has long embraced mass Hollywood releases on the cusp of their blockbuster rollouts. In 2005 Cannes hosted Star Wars: Episode III Revenge of the Sith and even piped over a massive sound system Darth Vader breathing along the Croisette in the hours leading up to the movie's zany red carpet premiere. And from Shrek to Kung Fu Panda 2, DWA has wrangled frequent Cannes premieres complete with screaming fans and all the festival trimmings. "This is my first time here in Cannes. To have my voice in Cannes is a good first step to actually being in a movie here," Ben Stiller, who voices the lion character Alex, said to laughs Friday. Co-director Tom McGrath voiced a bit of trepidation about the likes of Madagascar (which is screening out of competition) with the likes of others in the Official Selection including the latest from David Cronenberg (Cosmopolis), Jacques Audiard (Rust and Bone), Abbas Kiarostami (Like Someone in Love) and Walter Salles (On the Road). "We went to opening night and saw our cartoon [in a montage of Cannes films] and we thought, 'Do we deserve to be here?'" McGrath said. "But the great thing about Cannes is that it's a festival for all kinds of films - and this is a film about traveling through Europe, so what better place?" 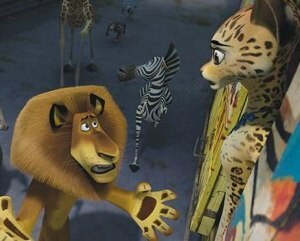 The third installment of the Madagascar franchise finds the lion Alex (Stiller), Marty the zebra (Rock) and the rest of the gang trying to find a way to return to their beloved New York City (you may have had to see the first two installments to get that one, but just go with it). Their quest takes them through Europe, landing in Monaco of all places in the famed casino. They find a perfect cover: A traveling circus, which naturally introduces new characters to the mix. "I auditioned for this part, and I was so happy when I got the part," said Jessica Chastain who plays a seductive jaguar in the feature. "I'm an actor who wants to do all kinds of things." "It's a very difficult thing to do," McGrath said about voicing movie animation. "You have to project that you're running in your voice when you're sitting in a studio and you have to change emotion. That's hard to do when you're only behind a microphone." Added Chastain, "I hadn't done anything before in which I didn't work with another actor." Still, the group said the medium allows for the actors to take time and not feel the pressure of time when working with a large crew, allowing them to workshop their characters to a degree, which was one creative appeal for taking part in Madagascar. But there was also another. "Cash!" said Rock. "And it was a lot of fun." Read more of Movieline's coverage of Cannes 2012 here.